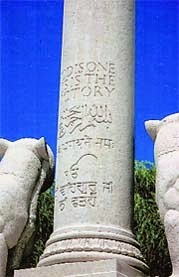 Column within the Indian Army Memorial at Neuve Chapelle. On lower part of the memorial is inscribed in English 'God is One, His is the Victory’, with similar text in Urdu, Hindi and Gurmukhi. The 8th (Jullundur) Brigade, which was part of the 3rd (Lahore) Division that fought during World War I, showed exemplary courage. ALMOST exactly one hundred years back, the Indian Army was drawn in to the vortex of the most terrible war mankind had known, after Germany invaded Belgium on August 4, 1914, which was followed by Britain’s ultimatum the same day. Two days later, the Government of India offered a corps of two infantry and two cavalry divisions for service "wherever required". The Indian Army was then largely committed on the North West Frontier but remarkably, just 20 days after the commencement of war, the first Indian combat troops of the 3rd (Lahore) Division had sailed from Karachi and Bombay westwards, vanguard of the million more who were to follow. Instead of Egypt, however, the Indian Expeditionary Force were diverted to France where the British Expeditionary Force were shattered and exhausted after two months of bitter fighting against the German Army's overwhelming numbers. Among the Indian Corps was a unique formation, the Indian Army Memorial at Neuve Chapelle, which was part of the 3rd (Lahore) Division and destined for glory in war. This brigade essentially comprised three battalions, which were the 1st Manchesters, 47th Sikhs, and 59th (Scinde) Rifles Frontier Force. Also included were troops from the State Forces, particularly Patiala. Other battalions were attached for short periods but the core three regiments, which still remain today are, respectively, the 2nd Battalion, the Duke of Lancasters’ Regiment of the British Army, 5th Battalion the Sikh Regiment of the Indian Army, and the 1st Battalion (Scinde) Frontier Force Regiment of the Pakistan Army. Once a year, boundaries are forgotten, and former officers from all three regiments share memories in honour of that close association of the past. The story of how a seven-year comradeship turned into a lifelong association is almost a contemporary Buddhist parable – with a strong message. Recalled is this 100-year-old association of ‘blood brothers in arms’, the troops having lived together in peacetime while stationed in Jullundur in the Punjab and then fighting together during the Great War of 1914-1918. In 1911, the Manchester Regiment were grouped together with 47th Sikhs and 59th Frontier Force to form the 8th Brigade, based in Jullundur. The peaceful pre-war years provided them with enough leisure time to play football and cricket against each other, and participate in other social activities such as drama clubs, and concerts. When war broke out in August 1914, the Jullundur Brigade sailed out, initially to Egypt in defence of the Suez Canal. 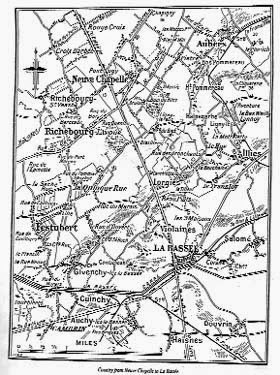 but shortly thereafter it was re-embarked for Marseilles in France and thereafter to the frontlines in Northern France where a desperate defence was being made against the formidable foe whose grand plan was to sweep the exhausted British and French Armies, reach the Channel ports and declare victory. This was not to be and this was largely due to the incredible fighting spirit of the Indian Corps. Over the next seven months, the Jullundur Brigade fought in the severe battles of Ypres, Neuve Chapelle, Festubert and The Loos offensive and greatly distinguished itself. Thereafter, in the winter of 1915, the Jullundur Brigade, as part of the with rest of the Indian Corps, moved to Mesopotamia (today’s Iraq). Over the next two years it took part in the gruelling campaign which eventually resulted in defeat of the Turkish Army. Their final theatre of war was Palestine, where the coup-de-grace was delivered to the Ottoman Empire. The Jullundur Brigade returned to India in 1918, the three battalions having been together in the same brigade, in war and peace for seven years, an incredible and unmatched record. 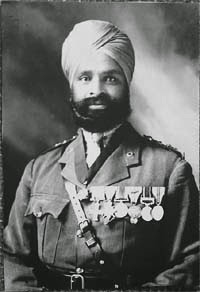 Subedar Major Thakur Singh Bahadur of the 47th Sikhs, who was among the first to receive the Military Cross for gallantry in action, on October 27, 1914 at Neuve Chapelle. One particular action took place on October 28, 1914, when two companies of the 47th Sikhs with two companies of Sappers & Miners without any artillery support, carried out an audacious attack to recapture Neuve Chapelle from the Germans, essentially the 16th Bavarian Infantry Regiment among whose rank and file was one Corporal Adolf Hitler. Covering the 700 yards of open ground between them and Neuve Chapelle by rushes alternating with fire, the four companies reached the ruins of the village. Casualties were numerous but the excellence of their fire control saved much heavier loss. The Indians drove out the Germans by close hand-to-hand fighting. From the Regimental record : "When our men were about 100 yards from the outskirts of the village, the Germans in the front trenches began to bolt, pursued by the gallant Sikhs and Sappers with the bayonet, a few being killed and others captured. The Indians then tore on into the village. Sikhs and Sappers mixed together, and worked in parties up the streets, under a furious fire from the roofs of buildings. The houses were cleared after desperate hand-to-hand fighting in which a man of the 47th is reported to have captured 3 Germans out of 8, having previously killed the other 5. From another house, the 47th recovered a wounded British soldier and 2 wounded Germans. 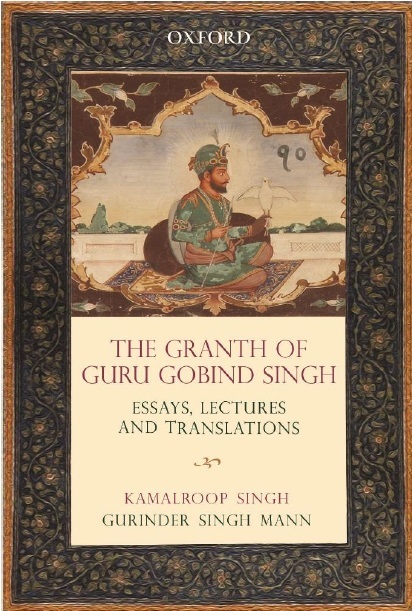 The latter were searched, and one of them lifted his voice and wept bitterly, evidently thinking that our men were feeling for a soft place in which to insert a bayonet, until comforted by a stalwart Sikh who patted him kindly with the words ‘Be not afraid’." On reaching the cross roads in the centre of the village, the troops came under frightful machine gun fire. Captain McCleverty, always in advance, cheered on his men, dashed across the roads, the rest following close on his heels but he was shot dead at a corner by a German concealed few yards away. Losses were rapidly becoming serious from enemy fire in the houses and several machine guns posted out-side Neuve Chapelle. The Indian troops had even penetrated to the eastern and northern borders where they were met by heavy fire and counter-attack after counter-attack was launched against them. "The blood of our men was up and nothing could stop them. After a prolonged and ferocious struggle, the whole of the main street was captured." The Germans held on and each house formed a small fortress which had to be stormed before further advance could be made. The Sappers & Miners were also taking terrible losses, especially their officers, charging with valour ahead of the men. The fighting went on, counter-attack following counter-attack, the German's using the bodies of their own dead as cover. Major SR Davidson of the 47th Sikhs was collecting his men for a final charge when the Germans came on in overpowering numbers from the north and east and at the same moment, the machine gun fire re-doubled its fury down the main street. Without immediate reinforcements, the position of the 47th was now quite untenable as their losses had been heavy. Thus Major Davidson was compelled to give up all he had won at such fearful cost, and retire, the line lying over some 500 yards of open ground, exposed to a tornado of shell and machine gun fire and the bodies of the gallant Indians soon lay thick on the ground. Eventually, the remains of the two companies of the 47th got back to comparative safety, but only 68 out of the gallant 289 actually collected on the La Bassee road. As Lieut-General Sir James Willcocks, commanding the Indian Army Corps in France, wrote, "The 47th Sikhs were raised in 1901 and have no battle honours on their colours. Throughout its service in France, this magnificent regiment never failed to answer all calls. Its reputation would be secure and its right to fight with the best British troops would be established, if based only on the record of Neuve Chapelle, but this action was only one of many in which the 47th distinguished themselves. The history of the Indian Army contains few nobler pages than that of the 28th October 1914." The blood brothers were to be brought together 75 years later by the idea of Major General Mohindar Singh Chopra, whose part in establishing the Wagah border on the GT Road between Amrtisar and Lahore in October 1947 is also part of history. As the senior most pre-partition Frontier Force officer of the Indian sub-continent, he was invited by his old paltan, the 59th Scinde Rifles Frontier Force, to visit them at Bahawalpur. At the formal dinner that took place, the 59th’ Jullundur Brigade trophy, a reminder of the past togetherness, was displayed and this inspired the three regiments to connect again. The old affiliations were re-established with the formal approval of HM the Queen and the three governments involved. The great friendship and liaison, which existed between these three battalions, had contributed largely to the magnificent reputation gained by the Jullundur Brigade. To commemorate such splendid association, three identical centre-pieces had been ordered from the Goldsmiths and Silversmiths Company, the centre-piece consisting of a triangular column rising from a triangular base, surmounted by a winged figure of Victory. At each corner of the base there is a silver model of a soldier of each battalion – an Englishman, a Sikh, a Punjabi-Musalman. Each battalion is now in possession of one of these centre pieces, presented by the remaining two battalions. In 2014, or 95 years after the event, the trophies are proudly displayed by the three battalions, now part of three different armies in Britain, India and Pakistan.